maemo.org - Planet maemo: category "feed:b45a8ddcf3f2f1452044ac0e6a02e711"
For two years the N900 was my digital camera. With the mobile phone replacing my digital camera I don't have to carry an extra device with me. Besides that my old digicam is broken and thanks to the N900 I didn't have to buy another one. However, the good old days of the N900 are gone. Can any of Nokia's new phones keep up with the N900 camera-wise? 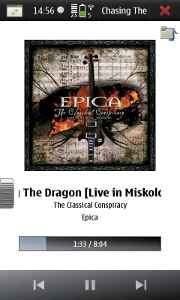 My little app Music Shelf is a MeeGo music player that aims to be simple, easy, and good-looking. It is the proud winner of the 1st WeTab Qt App Challenge in category Entertainment with 67% of votes. Now that the challenge is won, I'm working to target other MeeGo platforms besides the WeTab as well. Thanks to QML and Qt, this is not really a big issue. There are bad news for N900 users, though. Maemo5 PR1.3 is not capable of running the app smoothly, so I'm not releasing it for Maemo5. The N900 MeeGo Community Edition, however, runs the app just fine. 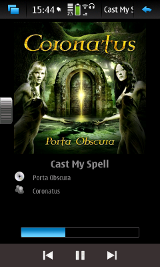 Another target is MeeGo Harmattan for the new Nokia N950 and N9 devices, where Music Shelf does really shine! 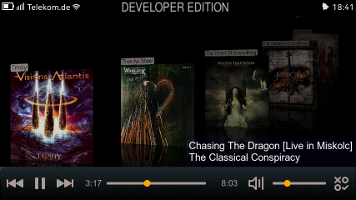 By the way, Music Shelf is powered by the Qt incarnation of MediaBox (which is my popular Maemo4 and Maemo5 project) technology. You can expect first releases for N900CE and Harmattan soon. And on the WeTab you can already download Music Shelf version 1.0 in the WeTab Market for free. In the course of learning to use QML, I have tried to build a book animation with QML for MeeGo. It not only runs well on the N900 with Maemo5, but also on the WeTab, the Lenovo IdeaPad S10-3t with MeeGo, my Ubuntu Laptop, and a friend even showed me how he was running it on Windows. This is a short video running a tech demo I made for the N900. Maybe we'll see some MeeGo software with this technology one day. For now it's only a tech demo looking for an application. A lot has been written in German media about the WeTab. Mostly, every news magazine tried to compare the Tab to Apple's iPad and came to the conclusion that it's not an iPad. What a surprise! 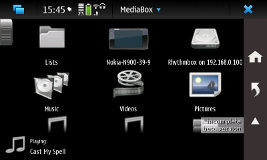 There is now a new version 2010.06.26 of MediaBox Media Center available in extras-testing for N900 and extras for N800 and N810. As far as I know, MediaBox is the first 3rd party media player on the N900 to support the Maemo MAFW framework for media playback. MediaBox is also the first media player written in Python to use MAFW for playback. Of course my code for using MAFW is open for anyone to use in their Python programs. Using MAFW on the N900 has some benefits. For instance, audio will play in silent mode and doesn't stutter while locking the screen. 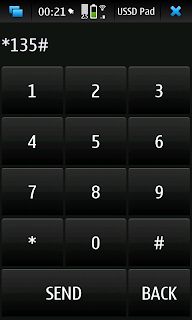 And you are able to control the volume with the hardware keys while the screen is locked (this requires Maemo5 PR 1.2). In case you prefer mplayer over MAFW, and have mplayer installed on your device, you can use it as media backend as well. Or just use plain GStreamer as before. The backend to use is configurable per media type. On the N8x0, the available backends are OSSO Media Server (the predecessor of MAFW), mplayer, and GStreamer. How do you normally get music onto your device? Now you can browse your UPnP media shares and download whole folders with their media contents onto the device. YouTube videos can be copied to the device, too, and MediaBox manages all this with the new download manager component. There have also been made some (a lot) performance improvements in the new version, and the handy sleep timer from the 0.96.x series of MediaBox is back. Enjoy, and please don't forget to vote for the package if you're using it from extras-testing on the N900! The Nokia N800, introduced in January 2007, was the first internet tablet from Nokia that featured a FM tuner chip (without RDS unfortunately). 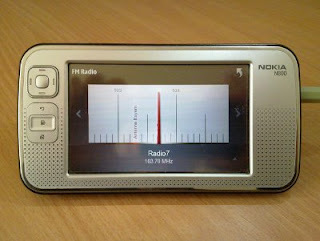 And now the popular FM Radio application from the N900 is coming to the N800 real soon! I'm currently working on N800 support in the application so that both devices will be sharing a common code-base. First we get a proof-of-concept for MMS, and now we can send USSD codes, such as *135# or *100# for checking your balance. It's still very early, but here's a screenshot of a working app. 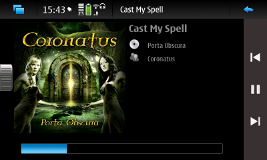 If you have been waiting for MediaBox Media Center on the N900, then I have good news for you. MediaBox version 2010.01.03 is now going to extras-testing for some QA. In the meantime for you to watch, I have recorded some videos with the N900's awesome TV-out feature. Browsing UPnP shares with MediaBox is as easy as browsing the filesystem. In this video MediaBox is used for watching a movie over WiFi on the N900. A new feature of MediaBox is the shelf. It's the starting folder where you can always return with the press of a button. You can put shortcuts to almost anything on the shelf for quick access (songs, albums, artists, videos, photos, folders, internet radio stations, playlists, you name it). 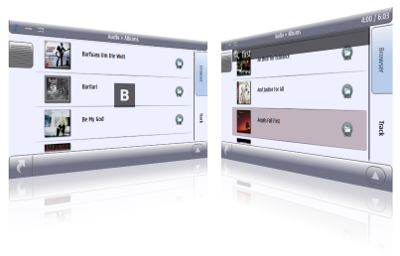 MediaBox has a finger-friendly way of reordering playlists. Simply drag the items with your finger. Oh yes, this video shows MediaBox in portrait mode. The upcoming MediaBox for Diablo for N8x0 will be quite similar to this version. The Fremantle version of MediaBox Media Center is coming along nicely. The latest development version (2009.11.1) is now in extras-devel, so if you're brave enough to test out hot fresh unstable stuff directly from extras-devel, you're invited to give it a try (installing just MediaBox from extras-devel should be pretty safe). The big news with the latest development version is UPnP MediaRenderer support. If you have a compatible (GUPnP-Media-Renderer has been tested to be compatible so far) UPnP MediaRenderer in your network, you can have MediaBox play on that renderer instead of your phone. If the MediaRenderer supports it, you can even play local files from your phone on it, not only stuff hosted on another UPnP/DLNA server. Eventually, this cool stuff will be available for N8x0 users, too, of course. Success! We can receive FM radio on the N900 now. 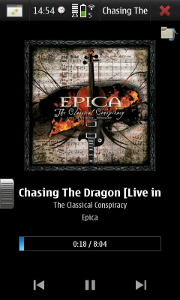 Controlling the FM radio in the N900 is tricky stuff. At first, the hardware is disabled for power saving reasons. Bluetooth has to be powered up, the I2C communication bus has to be powered up, and only then, the FM radio driver will actually load. I have created a package n900-fmrx-enabler for this task. The FMRX-Enabler is a D-Bus service that takes care about enabling the FM radio hardware on request and powering it down again when no application are using it. After the driver has been loaded by the FMRX-Enabler, the FM radio provides two interfaces for controlling. A classic Video4Linux2 interface featuring only the basic stuff such as setting the frequency and muting/unmuting it, and a sysfs interface where you can read and write into file-like objects to control the radio. does the job, after enabling PGA line2 and PGA capturing in the mixer. I have uploaded an application package fmradio for the FM radio to extras-testing. Testers are encouraged to test this, too. One drawback with the FM radio is that due to constant capturing and replaying, the FM radio is kinda demanding on the battery. There's no safe way around that. The unsafe way around that can damage your speakers, so capturing/replaying is a must. I'm gonna put up some developer documentation for the FM radio stuff. The upcoming release for the N900 will be the first version to provide suport for portrait and landscape orientations. Browsing your music feels great in portrait mode! MediaBox will support playing FM radio on the N900 as well (the N900 device specs don't list the FM radio, but there is one, on the Bluetooth chip). Media indexing is now driven by tracker, the native indexer of the Fremantle OS. And if you don't like indexing you can of course browse the file system as before. When you start MediaBox you will see the dashboard. This is where you can access your playlists, browse the device and your UPnP/DLNA servers, and access your indexed music, videos, and pictures. You can even put shortcuts to your stuff onto the dashboard for quick access, e.g. songs or albums you like, or folders with photos. No matter how deep within folders and subfolders you are, the dashboard is only one finger-tap away. 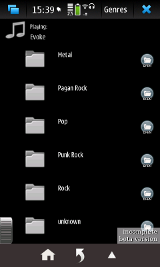 Another new feature is the folder history where you can see the folders where you recently were and go back. If you have Tuomas Kulve's ogg-support installed, you will also be able to play Ogg Vorbis and FLAC music. MediaBox still uses its own lightweight UPnP subsystem instead of gupnp that comes with Fremantle. My experience shows that the UPnP subsystem of MediaBox is still more compatible with the servers out there than gupnp is right now. MediaBox is currently in the extras-devel repository for Fremantle and it's marked as an incomplete beta version. I expect to upload the full release later this month, after which it moves on to the extras-testing repository for community Q&A. Then it should only be a matter of time until it will appear in the extras repository. The beta version in extras-devel is now updated frequently. The new version will also be available for Diablo after the release for Fremantle. Portrait mode will be supported on Diablo, too, if you have rotation-support installed. After several weeks of development, I have now released version 0.96.5 of MediaBox Media Center. Lots of user feedback helped shape the new version. Most notably the user interface looks a bit different now as it has been tidied up for a more consistent look & feel and much better performance with reduced memory footprint. The item lists have a thumbable scrollbar and a index letter display helps you find your way while quick scrolling. While searching for an item with the onscreen-keyboard or a hardware-keyboard, you can skip to the previous and next search results by pressing up or down on the D-pad. If you like to fall asleep with music or want to wake up with music, you will love the new sleep timer. Simply set the time when MediaBox should start or stop playing in the preferences viewer and select the media you want to have played. The sleep timer simulates PLAY and STOP actions so it can be used with virtually any media. For instance, you can have MediaBox wake you up with FM radio on the N800. With this feature, my N800 finally earned a steady place next to my bed. Do you like lyrics? MediaBox displays song lyrics in LRC format. LRC lyrics files need to match the file name of the song file, e.g. "Song.mp3" and "Song.lrc". LRC is a popular file format in China, and you can find lots of lyrics on various lyrics servers. Since LRC files are text files, you can also create them yourself. I plan on making a LRC editor for MediaBox in the near future, too. As always, MediaBox is available for N800 and N810 in the maemo-extras repository. deb packages from the Chinook maemo-extras repository server. A full list of what's new can be found in the release notes.